WASHINGTON — Solicitor General Elena Kagan, the former Harvard Law School dean who is a leading candidate on President Obama’s list of possible Supreme Court nominees, is facing opposition from some pockets of the political left because of her past statements on executive power and detentions, as well as her warm welcome by some conservatives. Kagan enjoys broad support from a range of scholars and legal specialists. But some academics and activists are raising concerns that, if confirmed to replace Associate Justice John Paul Stevens, she would be inclined to compromise with conservatives and pull the Supreme Court further to the right. With Obama sorting through about 10 potential nominees — including Kagan’s friend, the current Harvard Law School dean, Martha Minow — it is too early to gauge how Kagan’s chances of getting picked are being affected. But the complaints have grown loud enough that the White House, while declining to comment publicly, has begun providing background information to reporters in a bid to bolster her against charges from the left. Kagan, who has never been a judge, lacks a trail of courthouse decisions, which activists of all stripes say makes it difficult to fully gauge her views. A chief complaint from liberals stems from her statement during her 2009 confirmation hearing to be solicitor general, during which she agreed with a Republican senator, Lindsey O. Graham of South Carolina, who said the government could hold suspected terrorists indefinitely without trial. Fighting such detentions has been a major cause of many legal scholars, rights groups, and Democrats. She also is paying the price for positions taken by the Obama Justice Department, which has continued to defend Bush administration legal positions on warrantless wiretapping, detainees, and government secrecy. Kagan’s 2009 confirmation, however, mostly illustrated how she is difficult to pigeonhole ideologically. A Democratic senator, Amy Klobuchar of Minnesota, marveled during hearings that Kagan had “managed to get a standing ovation from the Federalist Society at Harvard,’’ referring to a conservative group that believes in strict interpretation of the Constitution. But during the same proceeding, Kagan declared that the greatest lawyer of the 20th century was the late Supreme Court justice Thurgood Marshall, a liberal for whom she clerked. She rebuffed efforts by senators who sought to draw out her views on the death penalty, for instance — potentially good training for the issue-avoidance rituals that are even more pronounced during Supreme Court confirmation hearings. Ultimately, three Republicans on the Senate Judiciary Committee backed her, and a fourth praised her without voting on the Senate floor. Graham, meanwhile, said earlier this week that he was pleased with the way Kagan responded last year to his questions about detaining enemy combatants. “I like her,’’ he said, while acknowledging that praise coming from him might alarm Democrats. To some in the White House, the positive response from across the aisle is potential reason to pick Kagan for the high court: It might avoid a protracted fight in a congressional election year. Other supporters say she would judge cases fairly and without an overlay of ideology. Curt Levey, executive director of the conservative Committee for Justice and a Harvard Law graduate, said Kagan “doesn’t seem to hate conservatives the way that some liberals do.’’ But what might prove more troublesome, he said, is that activists across the political spectrum are not sure where she stands. White House officials characterized the attacks as unfair and uninformed. 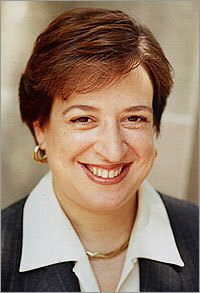 At Harvard, Kagan won praise from conservatives by hiring several new, right-leaning faculty members to a school known as a liberal bastion, including Jack Goldsmith, an international law expert who was a lawyer in the administration of George W. Bush; Adrian Vermeule, a former clerk to Justice Antonin Scalia; and John Manning, onetime clerk for conservative Robert Bork, the failed Supreme Court nominee. National Review, a conservative opinion magazine, reported that she hosted a “delightful’’ dinner for Scalia in 2006 to celebrate his 20th year on the Supreme Court — in contrast to Yale, where dean Harold Koh, also a rumored potential Obama Supreme Court pick, was said to have given the staunchly conservative justice an icier reception. Her role in an ideological controversy over military recruitment at the law school generated criticism from both the right and the left. After a 2004 appeals court in Philadelphia struck down a federal rule requiring law schools to permit access to military recruiters, Kagan banned them from Harvard Law’s career office. But in 2005, as the government was appealing that decision and was threatening Harvard with the loss of $400 million in federal funds because of Kagan’s stance, she reversed her decision. “I regret making this exception to our antidiscrimination policy,’’ she wrote to students at the time, according to the Harvard Crimson. Some liberals have accused her of giving in to the government on a matter of principle; conservatives have faulted her for fighting the policy in the first place. As solicitor general, which is one of the top positions in the Justice Department, Kagan has also drawn fire generally for the Obama administration’s policies on controversial subjects that carried over from the Bush era, including warrantless wiretapping, Afghan detainee policies, and rules about secret evidence. Kagan has not been required to argue or publicly formulate policies herself on all of those hot-button issues, but that has not stopped critics from attempting to link her to the Obama administration’s positions.